Here at Art Scatter we’ve been keeping a keen eye on this year’s political races and the concurrent pommeling and puffing-up of patriotism that’s been accompanying them. In ordinary times we don’t pay a whole lot of attention to the sloganeering of the love-it-or-leave-it crowd. People wave their flags and spout their platitudes, and life pretty much goes on, unimpeded. But it seems such a hot topic as November 8 approaches that we decided to consult an expert on the subject, Dr. Samuel Johnson, the noted English poet, essayist, and lexicographer. Dr. Johnson is a devout Tory but possesses a sharp wit and a keen mind, and will rail against foolishness and chicanery wherever he believes he has found it. Even in the midst of a vicious election season, he is no blind slave to party loyalty. The good doctor, as it turns out, has been busy checking proofs for his essay “The Patriot,” in which he expounds upon this very topic, and so could not meet with us in the flesh. But he agreed to answer questions through his publicist, Mr. James Boswell. The arrangement seemed congenial, and so we submitted our queries. In due course the good Mr. Boswell returned Dr. Johnson’s replies, a few from the very pages of the essay he’s been preparing. Here is the result of our long-distance discourse. Everybody’s talking about it, from presidential candidates to professional quarterbacks. And everybody seems to have a different idea about it. What exactly IS patriotism, anyway? The “common interest”? Sounds a little, I don’t know, socialistic. I had thought you were not so much in favor of a liberal application of the public purse, although it has been reported that you yourself were once in dire financial straits and in peril of the ministrations of bankruptcy court. One of our candidates, the one much praised for his business acumen, has in fact been there on several occasions, and advocates it as a sound financial strategy: borrow high, repay low, walk away debt-free, damn the consequences to the lenders. Interesting! I would like to return to the matter of the common interest, if I may. It is a very large issue in our current national debate, which to tell the truth – a rare commodity in this horserace, I am compelled to report – is something of a rabid shouting match: She’s a liar and a crook. He’s a liar and a crook and has a mancrush on the Russian. She’s the same old same old. He’s an agent of change. The millionaire’s only in it for the money. The billionaire’s only in it to help the little guy. She’s corrupt. He’s wacko. The whole thing’s rigged, and the corporations are pulling all the strings. If I may interject an editorial comment, yada-yada-yada. Still, if we’re looking for an issue in this most fractious of campaigns, the defining one might be the welfare and property rights of the individual versus the welfare of the public at large, among it those many marginalized for one reason or another. We hear, for instance, of “anchor babies” and the treachery of foreign-born terrorists and the tyranny of universal health care on the one hand. On the other, we hear excoriations of “the one percent” and the corporate defilers of the public weal for short-term private profit. And both candidates, of course, are people of the people. Can you expound? A patriot is necessarily and invariably a lover of the people. But even this mark may sometimes deceive us. The people is a very heterogeneous and confused mass of the wealthy and the poor, the wise and the foolish, the good and the bad. Before we confer on a man, who caresses the people, the title of patriot, we must examine to what part of the people he directs his notice. … If he consorts chiefly with the wise, the temperate, the regular, and the virtuous, his love of the people may be rational and honest. But if his first or principal application be to the indigent, who are always inflammable; to the weak, who are naturally suspicious; to the ignorant, who are easily misled; and to the profligate, who have no hope but from mischief and confusion; let his love of the people be no longer boasted. No man can reasonably be thought a lover of his country, for roasting an ox, or burning a boot, or attending the meeting at Mile-end, or registering his name in the lumber troop. He may, among the drunkards, be a hearty fellow, and, among sober handicraftmen, a free-spoken gentleman; but he must have some better distinction, before he is a patriot. It would seem, then, you are a believer less in the helping hand than the self-pulled bootstrap. You will find many in these Colonies who agree with you. Speaking of the Colonies: You have been no great admirer of the breakaway from the crown. You once said, contemptuously, of the revolutionaries who started this American patriotic movement: “How is it that we hear the loudest yelps for liberty among the drivers of negroes?” It is a point well taken, and not just in the matter of those brought forcibly here from Africa to be slaves, but also, as you have pointed out, in the case of those many native peoples who were driven violently and peremptorily from their homes by the British and other Europeans who made their own homes here. As you know, racial injustice remains one of the great divides in this angrily riven young nation. Are you saying these self-proclaimed American patriots, who so proudly proclaimed the former colonies’ independence from the British and all other crowns, were in fact traitors themselves? That man, therefore, is no patriot, who justifies the ridiculous claims of American usurpation; who endeavours to deprive the nation of its natural and lawful authority over its own colonies, which were settled under English protection; were constituted by an English charter; and have been defended by English arms. To suppose, that by sending out a colony, the nation established an independent power; that when, by indulgence and favour, emigrants are become rich, they shall not contribute to their own defence, but at their own pleasure; and that they shall not be included, like millions of their fellow-subjects, in the general system of representation; involves such an accumulation of absurdity, as nothing but the show of patriotism could palliate. He that accepts protection, stipulates obedience. We have always protected the Americans; we may, therefore, subject them to government. With all due respect, sir, I suggest you are fighting a war that has already been lost. Or won, depending upon where you stand. Back to these American elections: The nation has been riven by competing readings of the second amendment to its Constitution, on the keeping and bearing of arms. The arming to the teeth of the public, one side argues, has become a public health crisis; millions have been maimed or died needless deaths; millions more live in fear of unpredictable violence. It is our inviolable right, the other side proclaims: our arms guarantee our freedom from the tyranny of the state. Surely you agree that enough is more than enough, and, as our more liberal candidates declare, rational curbs must be applied? It affords a generous and manly pleasure to conceive a little nation gathering its fruits and tending its herds with fearless confidence, though it lies open on every side to invasion, where, in contempt of walls and trenches, every man sleeps securely with his sword beside him; where all on the first approach of hostility come together at the call to battle, as at a summons to a festal show; and committing their cattle to the care of those whom age or nature has disabled, engage the enemy with that competition for hazard and for glory, which operate in men that fight under the eye of those, whose dislike or kindness they have always considered as the greatest evil or the greatest good. This was, in the beginning of the present century, the state of the Highlands. Every man was a soldier, who partook of national confidence, and interested himself in national honour. To lose this spirit, is to lose what no small advantage will compensate. You are, I see, a firm Second Amendment man. You have armed yourself, at the least, with a fusillade of argument! And yet, in our nation, there are those who stoke a kind of patriotism by stoking fear. Fear of the other, fear of the outsiders, fear of the different, fear of those who have and of those who have not, fear of falling behind, of being limited in one’s options, of being taken advantage of by marauders from afar. You speak of walls. So does our rising tide of a candidate – of building a vast wall to protect us from our supposed enemies, and to force these enemies to pay for its construction. Facts fall willy-nilly in the quest to capture feelings, and therefore votes. What say you? Can a candidate who so plays with the emotions truly be called a patriot? (A) man may have the external appearance of a patriot, without the constituent qualities; as false coins have often lustre, though they want weight. A man sometimes starts up a patriot, only by disseminating discontent, and propagating reports of secret influence, of dangerous counsels, of violated rights, and encroaching usurpation. This practice is no certain note of patriotism. To instigate the populace with rage beyond the provocation, is to suspend publick happiness, if not to destroy it. He is no lover of his country, that unnecessarily disturbs its peace. Few errours and few faults of government, can justify an appeal to the rabble; who ought not to judge of what they cannot understand, and whose opinions are not propagated by reason, but caught by contagion. This selfsame candidate has treated the members of the press with contempt, sometimes barring them from his meetings, often herding them into roped-off spaces, taunting them in public, urging his followers to greet them with roughness, mocking one whose body is bent by disease. Others proclaim that the press have approached this candidate with timidity, refusing to point out his lies and prevarications, repeating his false charges against his opponents without proclaiming them proven falsehoods, falling consistently into traps he sets for them. These critics claim that such actions and inactions constitute cowardice and dereliction of duty, and are of themselves unpatriotic, for it is the duty of the press to proclaim the truth loudly, most especially when the truth is uncomfortable or the telling of it something that is feared. It is the quality of patriotism to be jealous and watchful, to observe all secret machinations, and to see publick dangers at a distance. The true lover of his country is ready to communicate his fears, and to sound the alarm, whenever he perceives the approach of mischief. … It is unpleasing to represent our affairs to our own disadvantage; yet it is necessary to shew the evils which we desire to be removed. Know these things, then: This candidate provably lies, and falsely accuses, and hides evidence of his own financial affairs, and enriches himself by not paying taxes, and impoverishes those who contract to do business with him by not paying agreed-upon wages for their professional services, and bangs the drum loudly against foreigners and enemies within; he indeed for many years proclaimed the incumbent president himself a foreigner and so the illegitimate holder of leadership; he vows to stop the trade in foreign goods while he himself flourishes through the ordering and importation of foreign goods; he courts violence by his followers against his enemies; he curries the favor of belligerent states and insults our foreign allies; and all the while he wraps himself in the piety of patriotism, proclaiming himself the natural leader of “true” Americans, who cheer him on. What say you to this? 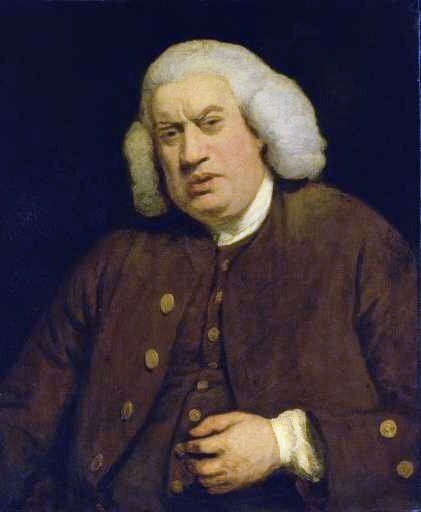 Dr. Johnson’s replies to our queries are culled from The Samuel Johnson Sound Bite Page. You could look it up.